Sharon is on a quest to prove that public libraries are a valuable part of the education of young people. She earned a Masters in Education in 2001 (She's older than she looks.) and a Masters in Library Science in 2007 and tried to apply her knowledge of cognitive development and education within the world of Massachusetts public libraries. While working as a Youth Services Librarian for almost a decade, she continued to be frustrated by the fact that public libraries and librarians are not a part of education policy or research. Her last attempt at making change from inside the field was as the Vermont State Children's Librarian. It was there that she realized that the only way to ensure a future for libraries and library funding is to prove that libraries matter to learning. And that's how she found herself at Pitt. Her research interests are obviously centered around libraries, but she is currently thinking about them through the lens of informal learning, professional development and youth/adult partnerships. 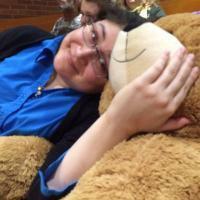 In her free time she hugs enormous teddy bears and reads Young Adult literature.